The two newly-split Mealy Amazon species (Amazona guatemalae, Amazona farinosa) have been heavily trapped for the wild bird trade, leading to a decline in population. 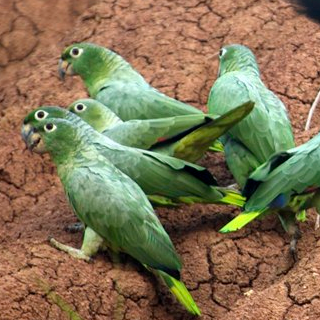 Progress and outcomes: In 1999 The World Parrot Trust teamed with American Bird Conservancy to fund a study on the effects of forest disturbance on Mealy Amazon behaviour and habitat use. In the later 2000s WPT funded a joint project involving New Mexico State University (NMSU) and the University of British Columbia – Okanagan (UBC-O) to determine if Central American subspecies virenticeps and guatemalae together should be designated a separate species from their South American cousins, subspecies farinosa and inornata. The researchers found that the groups were indeed distinct. Two new species, Northern Mealy Amazon and Southern Mealy Amazon, were recognized by IUCN in 2014. Their status in the wild was upgraded to Near-threatened. Organisations in Brazil and other countries rescue and rehabilitate the birds. From 2015 on, WPT has been supporting the rescue center ASM Cambaquara in Ilhabela, Brazil with specialised veterinary help, an additional keeper for bird husbandry, and new veterinary and other equipment. They have also conducted educational programs in schools and communities, using interactive presentations and various print and digital media to spread awareness about the Amazons. In 2018 WPT Brazil Program Manager André Saidenberg advised staff there on the rehabilitation/emergency treatment of Mealy Amazons and other parrots that they received, collected samples to determine their health status, and is advising on the proper release of these species on the island. Focus of future work: WPT will be involved with the conservation and ongoing rescue of these parrots from the wild bird trade, providing technical assistance and expertise regarding captive management, veterinary care, breeding, and recovery. Actions will include field research, long-term monitoring of release efforts, and providing educational activities and related resources to local communities. Where found: Northern Mealy Amazon A.g. guatemalae: Caribbean slope from Oaxaca and S Veracruz, S Mexico, to NW Honduras. A.g. virenticeps: W Panama, in W Chiriqui and W Bocas del Toro, north through Costa Rica and Nicaragua to Valle de Sula, NW Honduras. Southern Mealy Amazon A.f. farinosa: Amazonia from Guianas, N Brazil and SE Venezuela, in southern Delta Amacuro, Bolivar east of Rio Caura, and Amazonas, to SE Colombia, in Vaupes and Amazonas, and south to Santa Cruz, C Bolivia and N Mato Grosso, Brazil; also an isolated group in coastal Brazil from S Bahia and E Minas Gerais to N Sao Paulo. A.f. chapmani: E slopes of Andes from S Colombia in Meta, Caqueta and Putumayo to E Ecuador, E Peru and N Bolivia, in Pando to Cochabamba. A.f. inornata: Veraguas and Isla Coiba, W Panama, N Colombia, north of Andes, excluding north coast and Sierra Nevada de Santa Marta, south in Rio Magdalena valley to Cundinamarca and east to Sierra de Perija and NW Venezuela, east and west of Andes in E Zulia to Tachira and Pacific lowlands, west of Andes, in W Colombia south to W Ecuador, in SE Guayas and W Azuay. History: Mealy Amazons are found in Central America and parts of northern South America. The species was divided into five races in S and C America, but the two Central American forms of the parrot are genetically distinct from their South American cousins (Wenner, TJ, Russello, MA and Wright, TF. 2012). This has had ramifications for its future protection - in 2014 IUCN recognized two species, Amazona guatemalae and Amazona farinosa, and listed them both as Near-threatened due to over-exploitation for the wild bird trade and habitat loss. Since 1981, 49,600 individuals have been traded on the international market (UNEP-WCMC CITES Trade Database, January 2005). Ecology: Northern and Southern Mealy Amazons reside in dense humid lowland rainforest, near clearings, plantations with tall trees and forest edge and is also found in low montane rainforest in Honduras, as well as lower margins of subtropical zone in Panama. These Amazons are seen in pairs or flocks up to 20 individuals, with larger congregations at food sources. Large noisy communal roosts in tall trees outside breeding season sometimes consist of several hundred birds. They are well camouflaged while quietly feeding in upper stages of forest canopy for figs, young shoots and legumes.